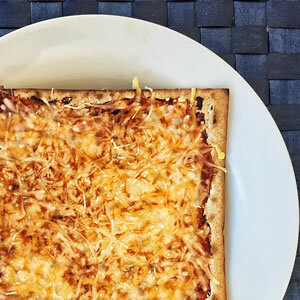 On the 14th of the Jewish month of Iyar, one month after the holiday of Passover, we celebrate Pesach Sheni–a “second Passover.” It’s customary to eat matzah on this day, but unlike on Passover, we don’t need to stay away from chametz. Here’s one fun way to eat the Pesach Sheni matzah. It's delicious year-round, too. Spread the tomato sauce on the matzahs. Bake on 375°F until cheese melts.